Our approach to evangelism shouldn’t be influenced by the way people respond to the gospel. When the gospel is preached faithfully and clearly, acceptance of the message is never the result of the skill of the messenger or the marketing of the message. As we have seen throughout this series, it all hinges on the receptivity of the human heart—the quality of the soil into which the gospel seed is sown. The “good soil” is well cultivated and produces the desired crop. Jesus says this symbolizes those “who have heard the word in an honest and good heart, and hold it fast, and bear fruit with perseverance” (Luke 8:15). This is the truly prepared heart. In Matthew 13:23, Jesus says the good soil pictures a person “who hears the word and understands it.” In Mark 4:20, He says it is a symbol of those who “hear the word and accept it and bear fruit” (emphasis added). He is describing someone with a heart so well prepared that when the person hears the gospel, he receives it with true understanding and genuine faith. The expression Luke uses (“[they] hold it fast, and bear fruit with perseverance”) suggests a tenacious hold on the truth, and perseverance in the faith. Perseverance with fruit is the necessary sign of genuine, saving trust in Christ. 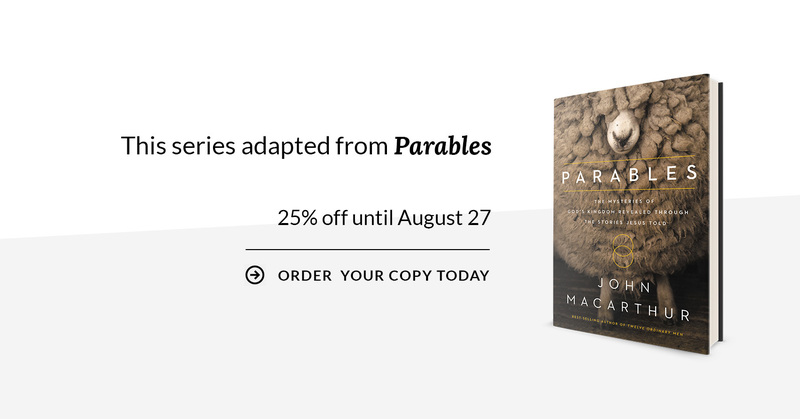 This is one of the key lessons of the whole parable: The mark of authentic faith is endurance. Jesus said, “If you continue in My word, then you are truly disciples of mine” (John 8:31). Temporary faith is not true faith at all. The expectation is that they will also bear fruit abundantly. Matthew and Mark both say “thirty, sixty, and a hundredfold” (Mark 4:20; cf. Matthew 13:23). Anything over tenfold would be an immense return on the farmer’s investment. While Jesus is clearly teaching what we know from experience—that Christians are not all equally fruitful—He is simultaneously suggesting that an abundance of fruit is the expected result of faith. The spiritual fruit in our lives should be copious and obvious—not so scarce that it’s hard to find. After all, we are “created in Christ Jesus for good works, which God prepared beforehand so that we would walk in them” (Ephesians 2:10). Jesus said, “Every branch in Me that does not bear fruit, [the Father, who is the vinedresser] takes away; and every branch that bears fruit, He prunes it so that it may bear more fruit” (John 15:2). Fruitfulness—a divinely wrought, abundant harvest—is the expected outcome of saving faith. That can occur only in a heart that is clean and well cultivated. The person’s heart needs to be prepared, ready to “receive with meekness the implanted word” (James 1:21, NKJV)—and then to nurture that seed to full fruitfulness. The Old Testament tells us that Rehoboam, Solomon’s foolish son and heir to the throne, “did evil, because he did not prepare his heart to seek the Lord” (2 Chronicles 12:14, NKJV, emphasis added). Also, to the backslidden people of Judah and Jerusalem in Old Testament Israel, God gave this command through His prophet: “Break up your fallow ground, and do not sow among thorns” (Jeremiah 4:3). The context in verse four makes it perfectly clear that He was commanding them to prepare their hearts to receive the word. That is the duty of every person. But here is the problem: We cannot accomplish that for ourselves. We are already hopelessly unclean. We are fallen, guilty sinners with shallow, weedy, rebellious hearts. Left to ourselves we would just grow harder. Every exposure to the light would bake in the hardness even more, until we became as impervious to God’s Word as a concrete walkway is to grass seed. “The mind set on the flesh is hostile toward God; for it does not subject itself to the law of God, for it is not even able to do so, and those who are in the flesh cannot please God” (Romans 8:7–8). Only God Himself can plow and prepare a heart to receive the Word. He does it through the regenerating and sanctifying work of His Holy Spirit, who convicts the world “concerning sin and righteousness and judgment” (John 16:8). For those who believe, He awakens them spiritually (Romans 8:11). He enlightens their minds to the truth (1 Corinthians 2:10). He washes them clean (Ezekiel 36:25). He removes the stony heart and gives them a new heart (Ezekiel 36:26). He indwells His people and motivates them unto righteousness (Ezekiel 36:27). He engraves the truth of God on their hearts (Jeremiah 31:33; 2 Corinthians 3:3). He pours the love of God into their hearts (Romans 5:5). We who believe in Christ are totally dependent on the indwelling Spirit’s work in our hearts to keep us tender, receptive, and ultimately fruitful. And we must remain faithfully dependent on Him. Like David, who prayed, “Create in me a clean heart, O God, and renew a steadfast spirit within me” (Psalm 51:10), we must approach God with trust and submission, knowing that He must do the necessary work in our hearts that we cannot do ourselves. Finally, this parable is a reminder that when we proclaim the gospel or teach the Word of God to our neighbors and loved ones, the results will always vary according to the condition of the hearts of our hearers. Success or failure does not hinge on our skill as sowers. Some of the seed we disperse will fall on hard, shallow, or weedy ground. But there’s nothing wrong with the seed. If you are faithful at the task, some of the seed you throw will find well-cultivated soil, and the result will be abundant fruit.